Planet Zoom 3D is a steampunk, side scrolling platform/puzzle/maze game! 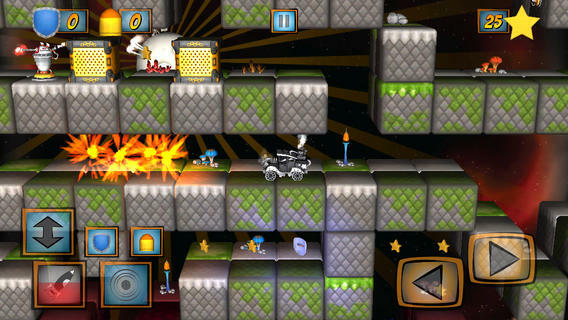 The player plays the role of Slim Boy and drives a steam tank in a cube world called Planet Zoom. Slim Boy’s girlfriend is kidnapped by the Evil Robot! Slim Boy’s mission is to save the girl, but every time he gets close to the Evil Robot, he manages to run away! Slim Boy must follow Evil Robot and his captive by avoiding traps and pitfalls every level. Slim Boy’s tank can drive on ceilings thanks to an anti-gravity field. Slim boy can activate the anti-gravity field at any time. The tank can also shoot explosive bullets and anti-gravity bullets. The anti-gravity bullet gives the field to other objects that fly against the ceiling. Slim Boy has the chance unlock different tanks in the tank garage with enough stars he collects each level trying to save the girl. Accept the challenge and save the wonderful girl! It’s Slim Boy’s mission, it’s your mission!